Cristiano Ronaldo lead Real Madrid to move three points clear of Atletico Madrid and four points clear of Barcelona in La Liga thanks to a comfortable victory against Levante at the Santiago Bernabeu. 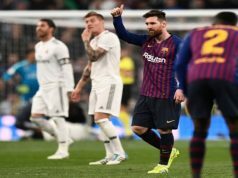 Los Blancos proved they are the team to beat in Spain at the moment, and they took advantage of the Azulgranas’ defeat at Valladolid to increase their lead. Carlo Ancelotti men were on top for the majority of the match, going in front after just ten minutes as Ronaldo leaped to meet Angel di Maria’s cross in a corner and powered a header into the bottom corner. Karim Benzema had clear chances to double his side’s lead, but he was unlucky. The Frenchman sent a volley over the bar from inside the box and hit the woodwork after being denied by Keylor Navas. Madrid were two in front a couple of minutes after the break. Ronaldo bursted inside from the left and reversed a pass inside for Marcelo, who wonderfully whipped a right-footed shot into the far corner. Levante’s hopes of salvaging anything from the match were made almost impossible in the 64th minute, when David Navarro shown a red card. The Levante defender came in right through the back of Ronaldo with no attempt to claim the ball, although it was probably slightly harsh to be a red. Benzema headed against the post again before Los Merengues scored their third courtesy of an own goal from Nikos Karabelas. Marcelo sent a cross to the back post and the Levante left-back fired the ball into his own net in an attempt to clear the ball. Ronaldo was close to making a deserved brace as he hit the Levante woodwork for a third time. Los Blancos opened up clear daylight to Atletico Madrid and Barcelona, although they might have starting problems at right-back, since Daniel Carvajal got injured, joining Alvaro Arbeloa in the infirmary.